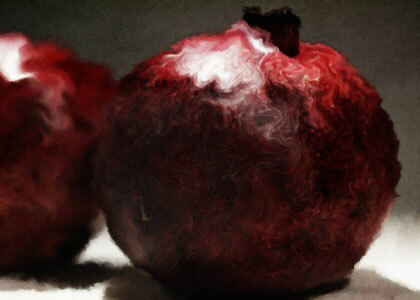 If you could sequence the DNA of Langers Pomegranate Juice and trace it back to its source, you’d find a series of activities – from picking to pressing to pasteurizing to palletizing, with dozens of other steps in between – that makes each bottle of the juice a superb study in syncopation. To understand how Bruce and David Langer got to this point – two smart, quiet Southern California boys overseeing a $180 million juice company — you need to go back a ways. 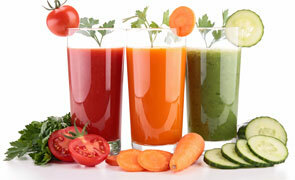 Started in 1960 by Nathan Langer as a healthy juice company producing a unique assortment of fresh-squeezed juices, Langer Juice Co. Inc. today is a multi-dimensional, family-run company with a diversified portfolio of beverage options. Most importantly, the company prides itself on maintaining its independence and flexibility throughout its evolution among big juice players. “My father started [the company] making health food juices, which at that time only appeared in health food stores," recalls Bruce Langer, co-vice president of the company. "There was a time when it was fresh and not shelf-stable." The juice, formerly known as L&A Juice, was available only in Southern California. Apple juice is the mother's milk of kids these days. And store shelves are heavy with apple juices aimed right at the stroller set. Taster's Choice took a gander at these juices, all made from concentrate, after evaluating juices pressed from whole apples last week. 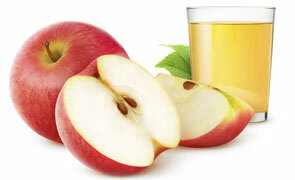 Overall, the whole-apple juices had far more apple flavor and their looks varied widely. It's amazing how similar the juices from concentrate are. They're all crystal clear, amber-colored and all have vitamin C added but no extra sugar. Industry—Quietly tucked away at the end of a cul-de-sac in this manufacturing-laden town, "sandwiched" between the 60 (Pomona) freeway and Valley Boulevard, sits one of the juice industry’s most profitable family-owned firms. Thirty-nine years after being founded, Industry-based Langer Juice Co. Inc. shows no signs of the stress and strain that have often befuddled other family-operated companies. 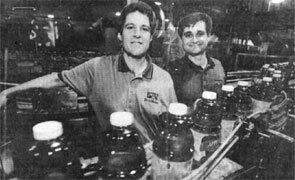 Langer Juice, with its 200 employees, is still headed by its founder, Nathan Langer, now in his 70’s, while the firm’s day-to-day operations fall to his two sons, Bruce, 40, and David, 44. A third son, Dennis, is a vice president with pharmaceutical firm SmithKline Beecham in Philadelphia.